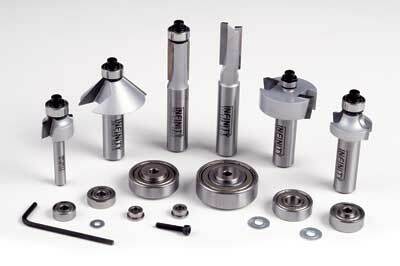 Infinity Cutting Tools are the UK outlet for Infinity Cutting Tools USA. This distributor of quality tools in the US and around the world also designs the router's cutters, which are then made for Infinity to their specification. They have been marketed here in the UK for some time, but don't grab the headlines like some well-known brands which many of us are familiar with. However a quick trip to the website - www.infinitytools.co.uk - reveals a veritable cornucopia of cutters waiting for the keen router buff. Since this is an American inspired range there are some variants from the usual types, thus offering more choice and hopefully, inspiration. They are not budget cutters, neither the price or physical appearance would suggest that at all. Instead they are a premium brand intended for hard work and a long life. I looked at the 'Essential Six' set to see if they offered something useful for me. They are available individually as well, but are intended to cover some standard requirements and give a 10% discount as a set. Looking at the 'Numbers' box, you'll see a substantial group of cutters backed up by a lot of different diameter bearings for the rebate cutter and not a dovetail cutter in sight. The last observation relates to almost every cutter company's predilection for including a spurious dovetail cutter that has no sensible function on the grounds that customers expect to see one: what tosh! Which left me wondering who Infinity Tools see as the natural user of this particular set. Truth is, most router users may have some exotic or unusual cutters (I do) but how often do these lumps leave the toolbox? For most purposes and for contemporary furniture in particular this set would meet a lot of needs. One could argue that more straight cutters are needed, but that drives the cost up, and these can be acquired separately in any case. Infinity Tools supply a number of cutters sets with specific purposes such as Window Sash, Box Joint and Variable Slot Cutter to name but three. The UK website links to the American parent website, and details there the care that goes into the design and manufacture of all these cutters. Certainly on examination the ones we had on test are accurately machined, have no visible gaps in the tip brazing and are finished in neat metallic silver. Infinity's Rebate Bearing Set seems to have a ridiculously wide (quite literally) range of bearing diameters which will stretch the imagination a bit finding uses for them all, with the Rebate Cutter. The 1/8" Roundover Cutter is great for conferring a neat, modern safe edge finish on furniture but it is best used in a small router, hence the 1/4" shank diameter. For bevel work the Chamfer Cutter has plenty of uses, from removing an arris (meeting of two adjacent edges) to stopped chamfers or shaping the edges of blocks or plinths. The Flush Trim Bit isn't the longest on the market but is plenty long enough for trimming solid lippings or veneers flush with the main surface. It has a glue shield to prevent the bearing clogging and thus ceasing to rotate easily. A larger Roundover Cutter is an oft used size that allows rounding of edges or adding moulding detail with a quirk (step) at the top by making use of the straight section of cutter. The Straight Cutter (which lacks a bottom cutting insert) is self explanatory, however as I said before, although one is extremely useful, more in different diameters and lengths will be needed as straight cutters can perform so many different tasks. In comparison to other cutters in terms of experience and handling, it's fair to say the Infinity set is as good as any we have used, with painfully sharp edges on finely ground TCT blanks that are a respectable thickness, and cutter bodies that are well balanced and run smoothly. Ideally we would like to try a wider variety of cutters from this source, to get a better impression of what practical options there really are - we may well follow this up in the near future in fact. However the 'Essential Six' is a great starting point for anyone who wants to set out with decent reliable cutters for basic operations, with the option to expand their cutter set later on, and suggests more than anything that these guys really know what they're doing. Hopefully there will be a lot more good news from Infinity and beyond! "The Infinity set is as good as any we have used"
Chamfer Bit - cut height 9/16"
Roundover Bit - cut height 1/2", cut radius 1/4"
Straight Bit - cut diameter 1/2", cut height 1"
Roundover Cutter - 1/2" cut height, cut radius 1/8": this is on a 1/4" shank. Huge kit of bearings supplied free. All five cutters come as 1/2" shanked cutters.